Welcome to the fundraising campaign for Super Can Man and the Vascular Institute of Michigan! This is the 3rd annual VIM Cares Let’s Can Hunger Food Drive. Since its inception, the Vascular Institute of Michigan felt it was important to give back to the community. In the last two years, VIM and friends have been supporting the Food Bank of Eastern Michigan in its goal to feed the hungry. Born out of this event was SUPER CAN MAN, the masked hero who is out to rescue the hungry one can at a time! With the help of so many... his family, friends, school (Holly Elementary), volunteers, and the Vascular Institute, Super Can Man is doing GREAT things in the community that his mother works in every day. Who is the hero behind the mask? Seven-year-old Liam Senton. His efforts have produced $2,000 and almost 3,000 non-perishable food items! Super Can Man invites the community at large to join him in a series of adventures, culminating in a family event at the Vascular Institute, please see below for details. All donations benefit the Food Bank of Eastern Michigan and you are also welcome to donate directly on this page, safely and efficiently. The Food Bank is able to provide 6 meals for every 1 dollar donated. Serving families in need since 1981, the Food Bank of Eastern Michigan has grown to provide more than 28 million pounds of food, including over 10 million pounds of fresh produce, each year. Working through a network of more than 415 partner agencies, including local food pantries, soup kitchens, and shelters, the Food Bank impacts more than 331,000 people who struggle with hunger throughout 22 eastern Michigan counties. 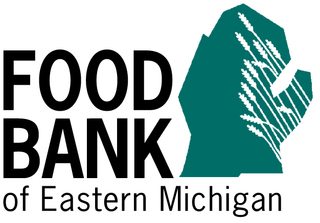 The Food Bank of Eastern Michigan is a 501(c)3 organization. You can also shop online at Super Can Man's Tupperware Fundraiser until April 21, 2019. 20% of those sales go to the Food Bank of Eastern Michigan. Very Proud of you Liam!